So the monster is captured or slain, is there a useful resource to be gained? Ant parts are flexible and resilient and can be fashioned into lightweight arms and equipment. Soldiers – carapaces make armour equivalent to studded leather; mandibles make good improvised pick-like weapons with good penetration power (damage equivalent to pick/axe). Queen – thorax makes a chest covering (fits like leather, but protects like chain) or a shield; head makes a helm (equivalent of +1), with an aesthetic which is unnerving to lower powered creatures with above animal intelligence (e.g. orcs). Giant ant larvae are a local delicacy, and are known as ‘dirt lobsters’. 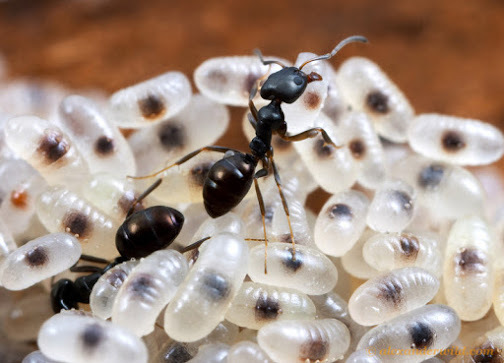 In the big cities giant ant larvae command eye-watering prices. Restaurants and food dealers will pay adequately for these – they do not need to be alive, but they cannot be spoilt. Beast masters will pay handsomely for any living giant ant larvae, as giant ants can be trained to relentlessly repeat a task, e.g. carry ore from a mine, follow a person, or keep an area clean. The larvae must be kept warm and humid if they are to survive and hatch. For a live Queen larvae, beast masters will pay nearly any sum.